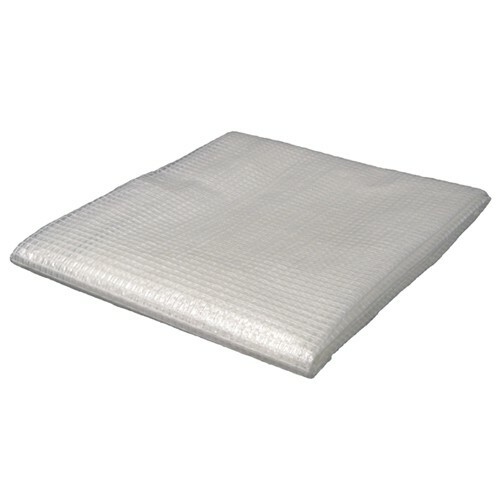 Clear covers are 6 oz per square yard, UV 3% treated, 3X3 polyester mesh count and 12 -14 mil thick with grommets ever 36” apart and corner reinforcement and furthermore rot & water proof . The material is clear with square nylon thread sewn in little squares. Most clear tarps are used for agricultural purposes and canopy cover and many outdoor protection needs light is required. -Metal Grommets Approximately Every 36"
A clear poly tarp would be great as a temporary outdoor sunroom for plants, flowers and vegetable gardens. The clear poly can be easily attached to any frame structure by using ball bungee ties and is light enough for PVC structures. Furthermore, the clear plastic material can be used as a fence tarp for agricultural gardens to prevent incoming debris. As a weather protection barrier, the clear tarp will keep gardens safe from outside elements but will still allow the sun to penetrate for optimal growth. Best of all, the clear tarp is made of polyethylene and is naturally resistant to mold, rot and mildew. The poly cover can be used outside for protection year after year.